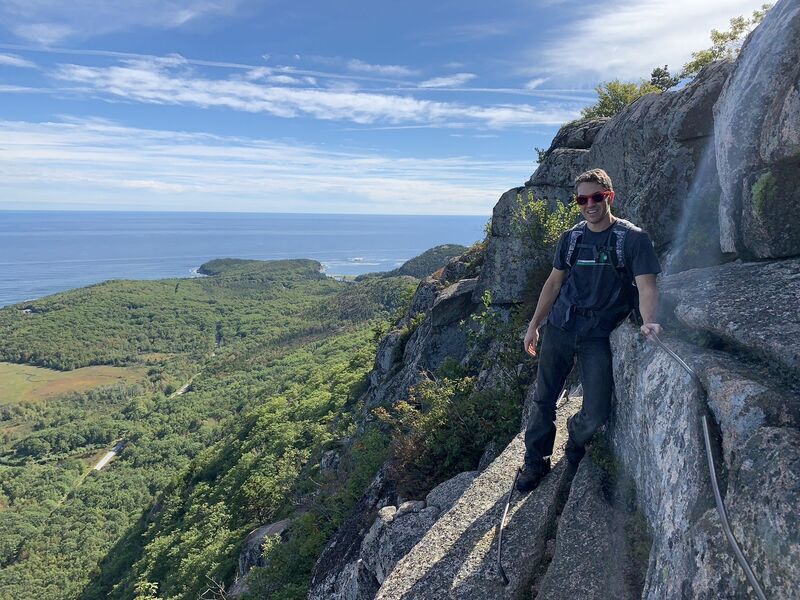 Precipice, Orange and Black and Champlain North Ridge Trail Loop is a 2.1 mile moderately trafficked loop trail located near Bar Harbor, Maine that features beautiful wild flowers and is rated as difficult. The trail offers a number of activity options and is best used from March until October. The trail is closed between March 15 and August 15 due to falcon nesting. 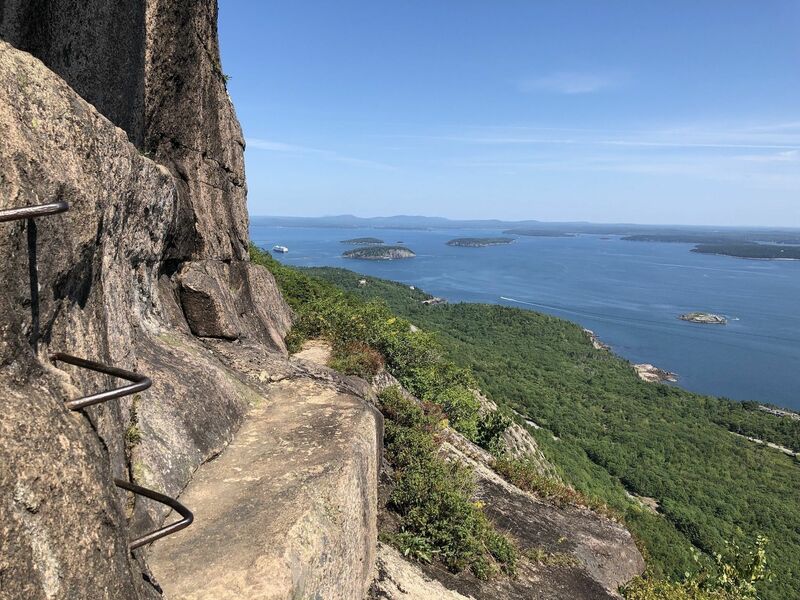 The Precipice Trail is a difficult and very steep loop trail using iron rungs and ladders on exposed cliffs providing spectacular views of Acadia National Park. 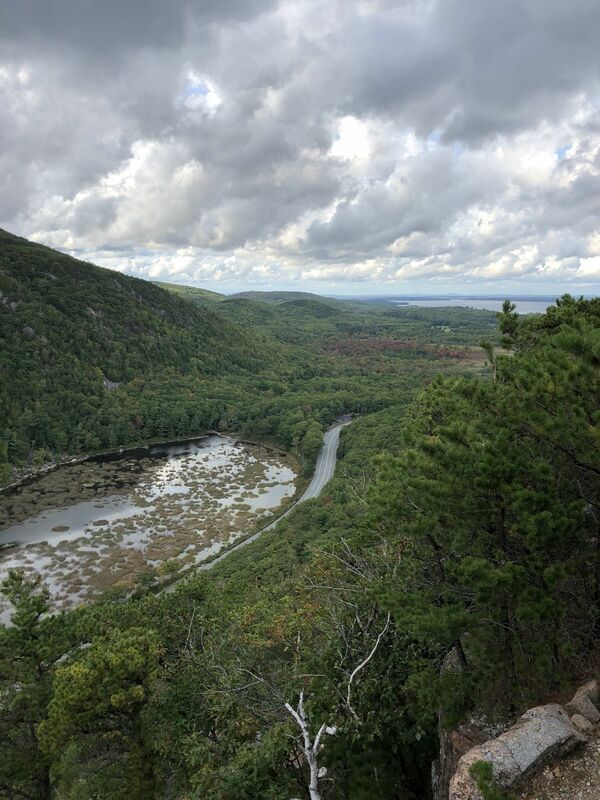 The trail opens after nesting Peregrine Falcons leave the nest. 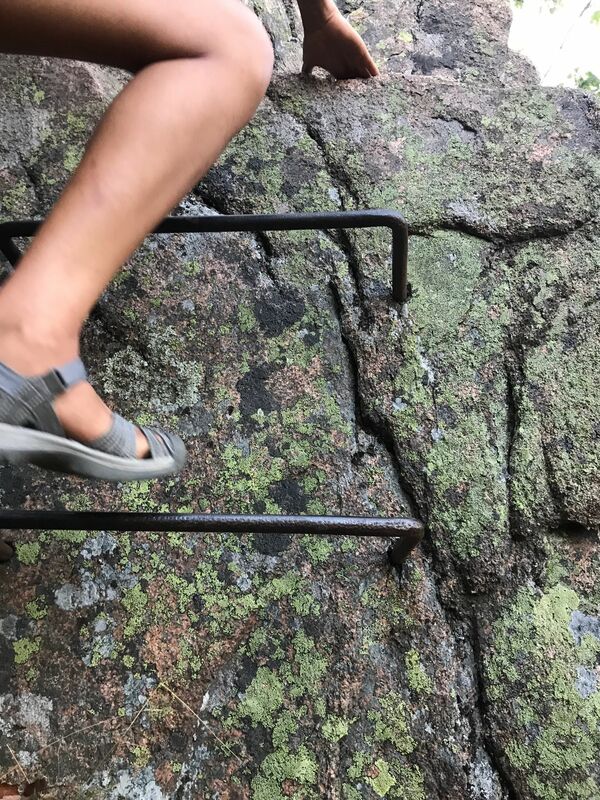 The hike is not recommended during wet conditions, or if you experience vertigo; also not recommended for small children.The trail starts up steps and through some boulder scrambles. 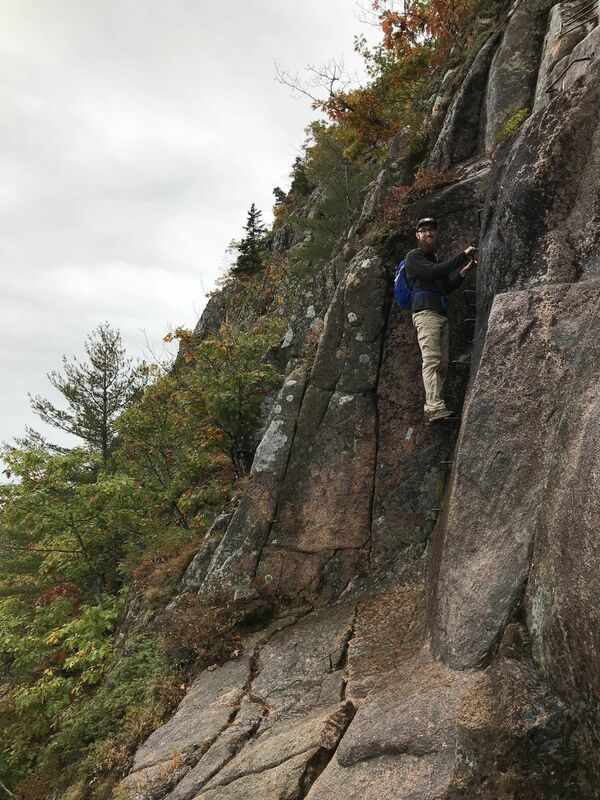 While officially a non-technical hike due to strategically placed iron rungs, ladders and rock ledges, this is really a climb that requires you to be able to navigate some tricky spots by pulling yourself up (e.g. the very first example of this might even be the hardest). If you are careful and pay attention, this will be a great and thrilling experience. 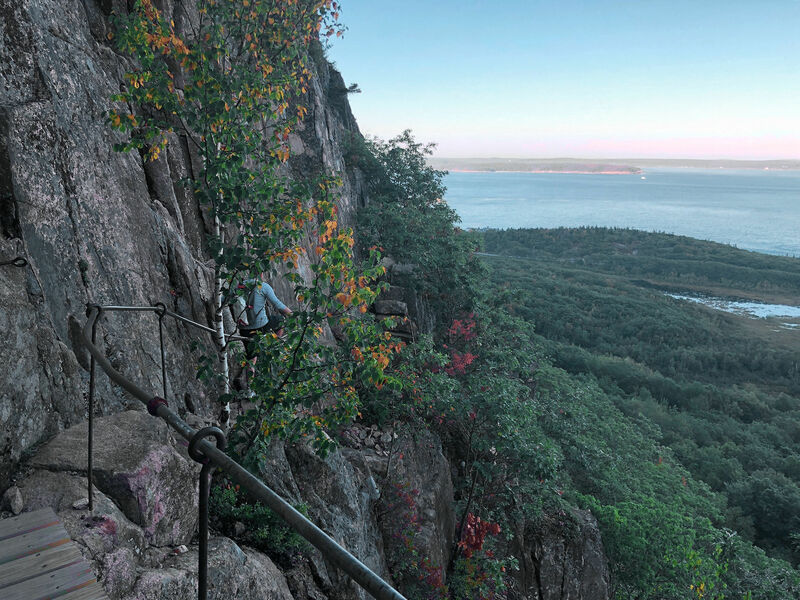 Leave hiking poles behind, as you won't need them and they'll just get in the way. 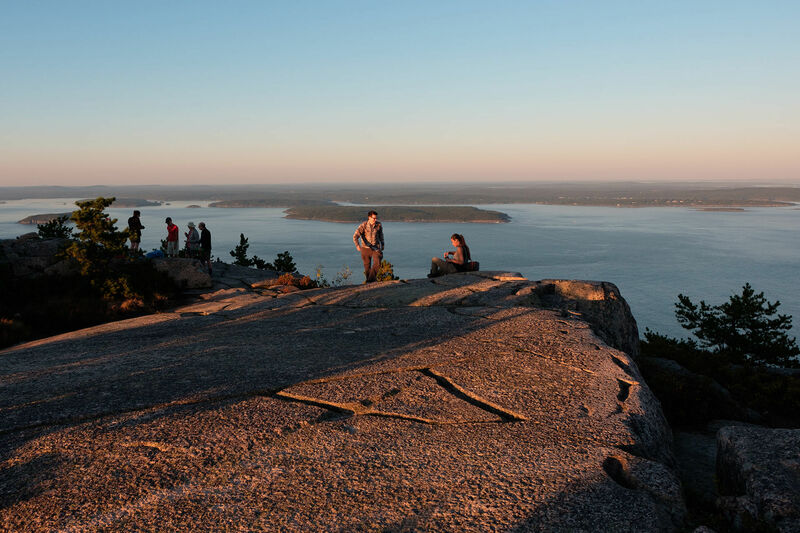 One of the very best short hikes in Acadia, similar to what you get on Katahdin's Knife Edge. 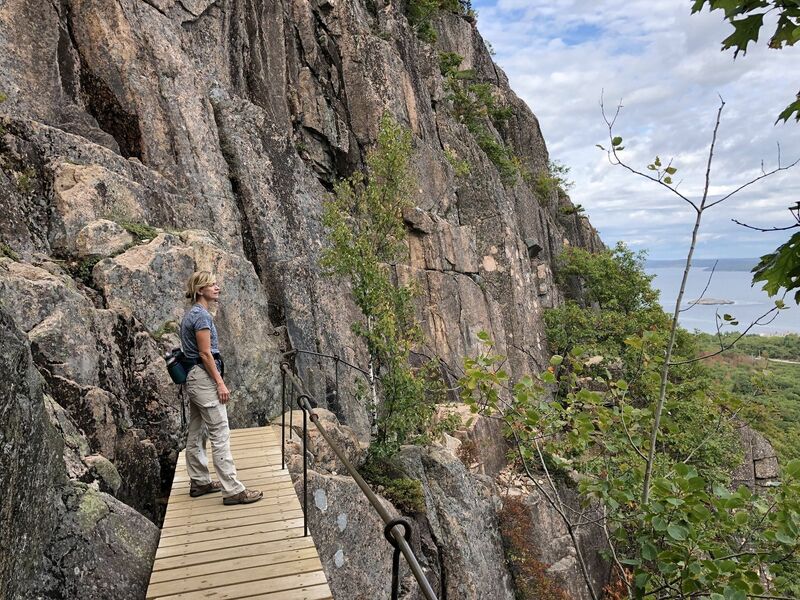 The Precipice is one of the most popular trails in the park - and one of the most challenging. 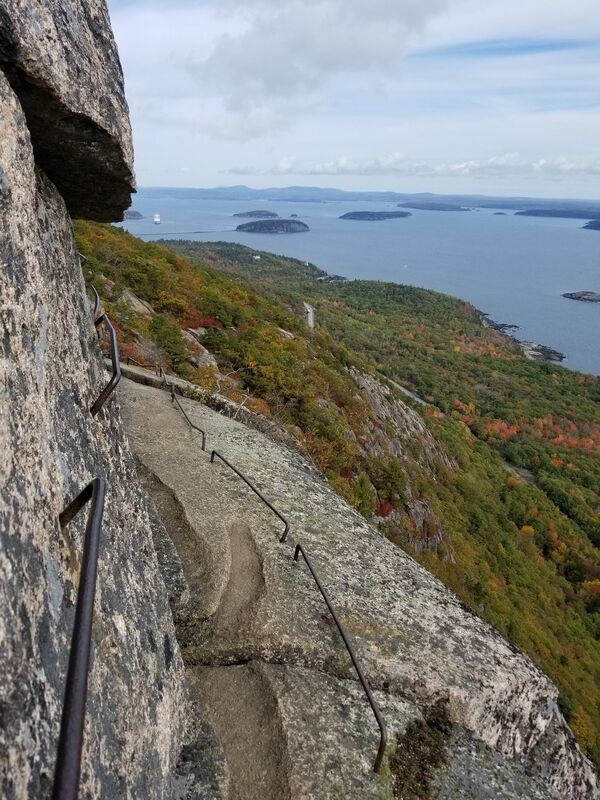 Rungs and ladders and narrow ledges make this climb not for the faint of heart. 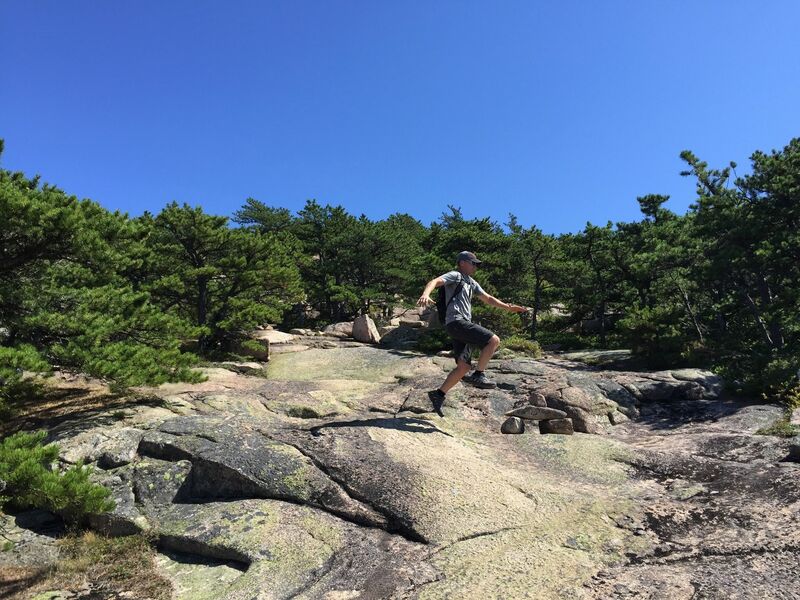 If you do decide to take the hike give yourself plenty of time, bring water and sunscreen and wear sturdy foot gear. Stay on the trail. 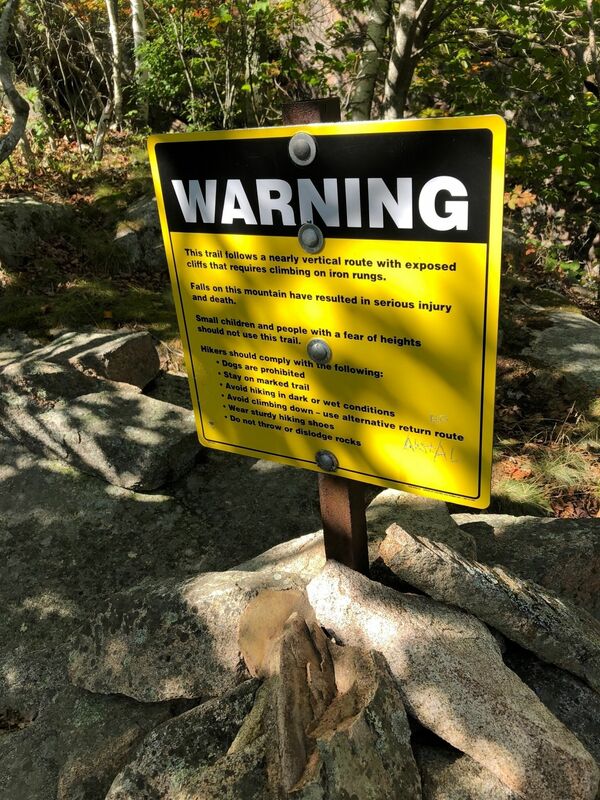 Most accidents occur because hikers wander off the trail or are unprepared. 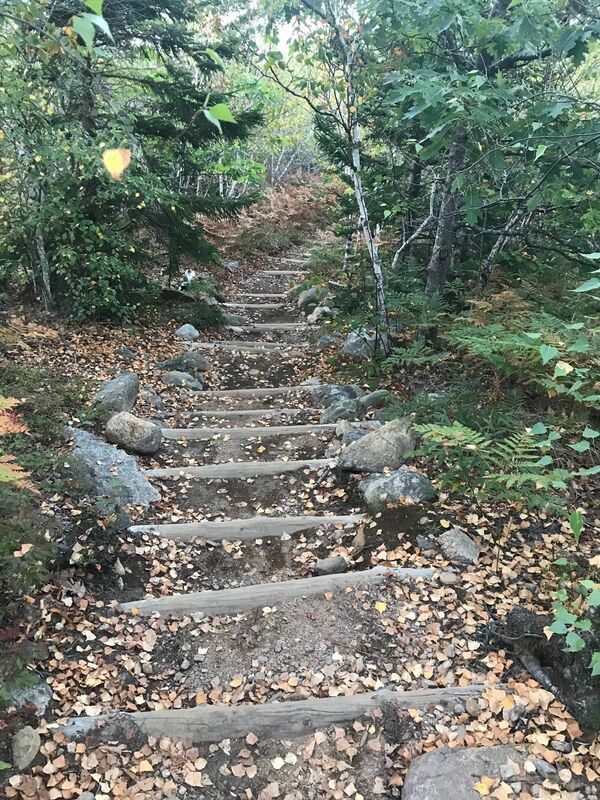 Because the trail is so steep it is recommended that you take one of the less steep trails down. 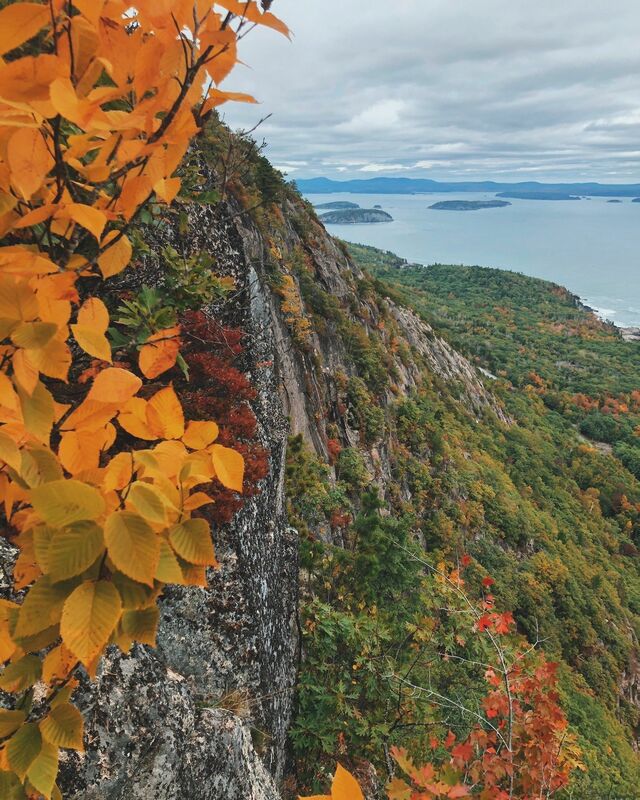 From the summit of Champlain Mountain the views are worth the effort. The trail may be closed spring through mid summer because this is perfect nesting habitat for peregrine falcons. If the trail is closed there is usually a ranger at the trailhead with a spotting scope. They are looking for peregrines and their nest site. The ranger will be able to answer your questions and possibly show you a peregrine falcon. 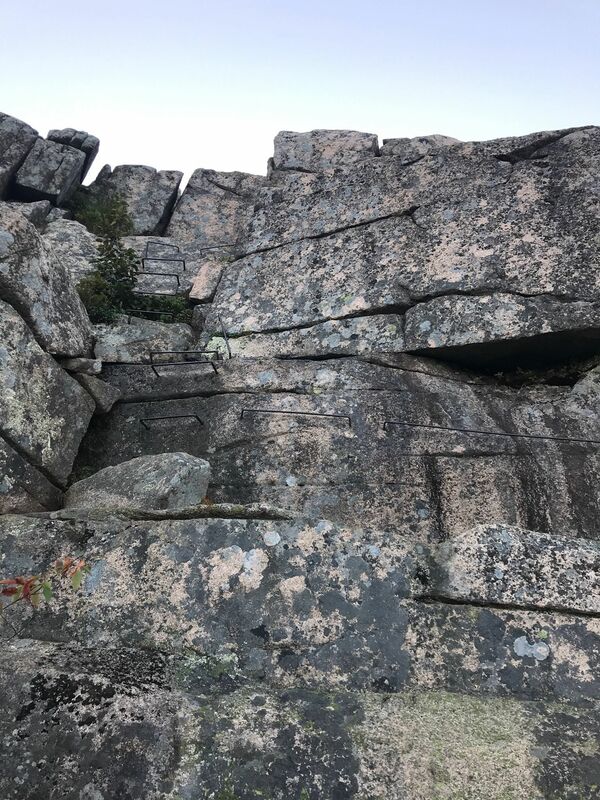 This sheer cliff face is typical of Acadia's mountains. 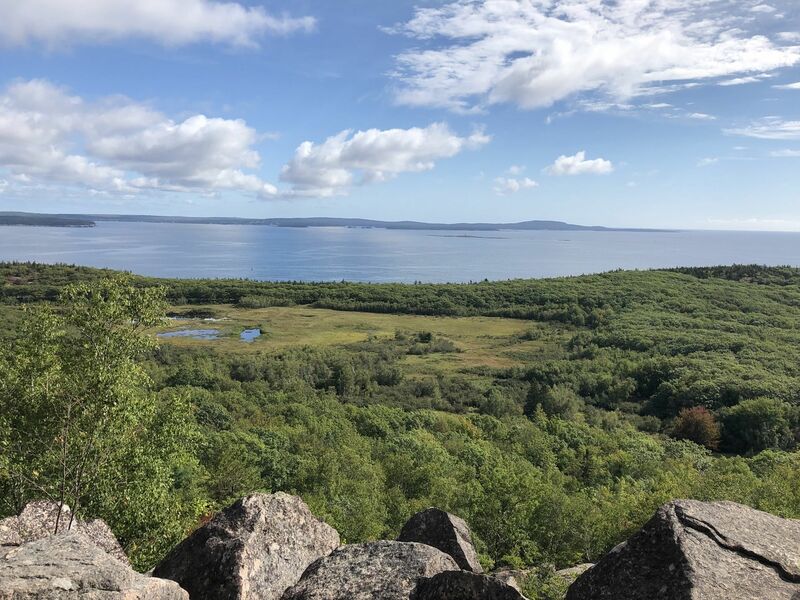 18,000 years ago when glaciers swept over the island like giant bulldozers, they smoothed the northern slopes of its mountains. The southern slopes underwent a very different process. Ice melt refroze in the cracked granite and as the glacier moved on it pulled great chunks of stone from the mountainside, leaving sheer cliffs facing in the direction of the ice flow. The peregrine falcon is about the size of a crow and can be identified by its pointed wings and narrow tail and if you can see its face it appears to have on a black hood. In flight it has short wing beat similar to that of a pigeon. It preys on other birds and can capture them in flight as it reaches speeds of over 100 mph. The peregrine's population began declining in the 1950s due to the presence of DDT in the food chain. The last peregrines were recorded here in 1956. Then in 1984 chicks were raised in the park as part of an endangered species reintroduction program. The hope was that they would imprint on the location and come back to nest when their time came. In 1991 a pair of peregrines did return and had a successful nesting. 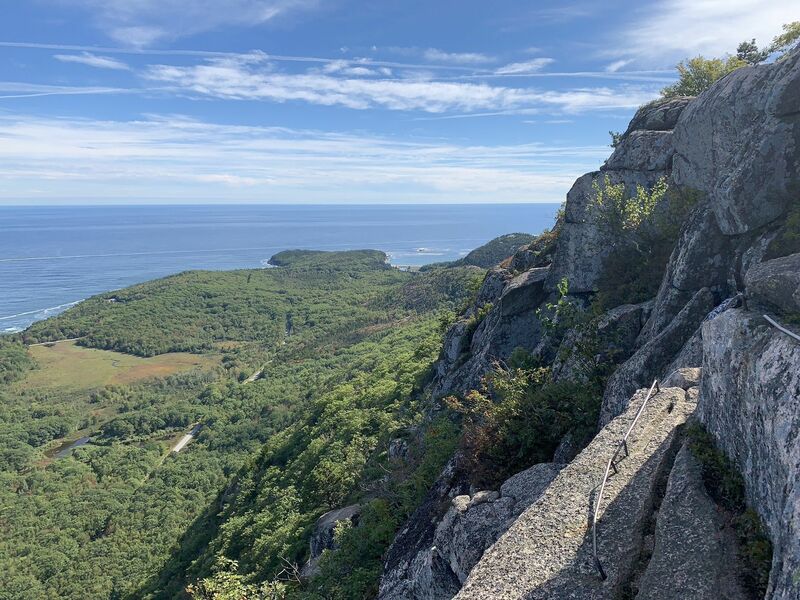 Nearly every year since, falcons have returned to Acadia and have found a favorable nesting site in these cliffs and others in the park. The body of water on your left for the first half of the loop road is Frenchman's Bay. Its name is a testament to the strong French heritage of the area. 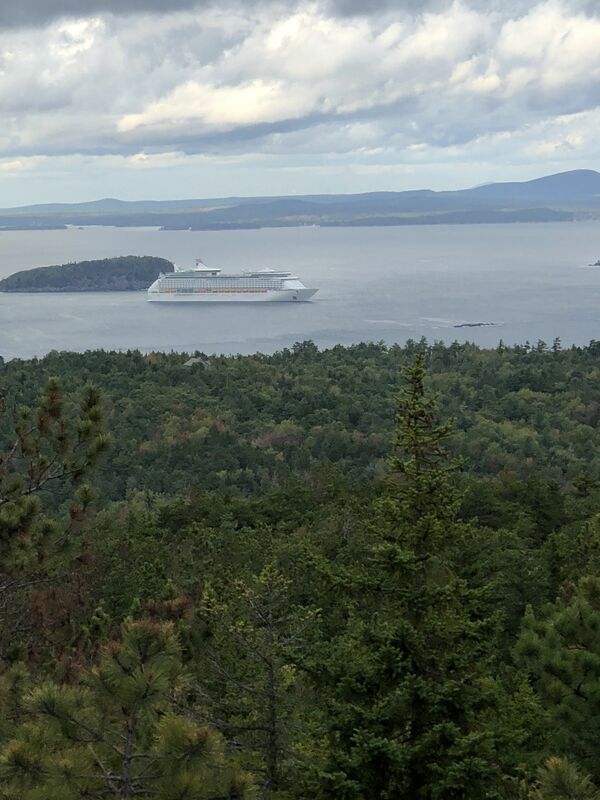 It is a deep-water bay and in the fall you may see large cruise ships that make regular stops in Bar Harbor. 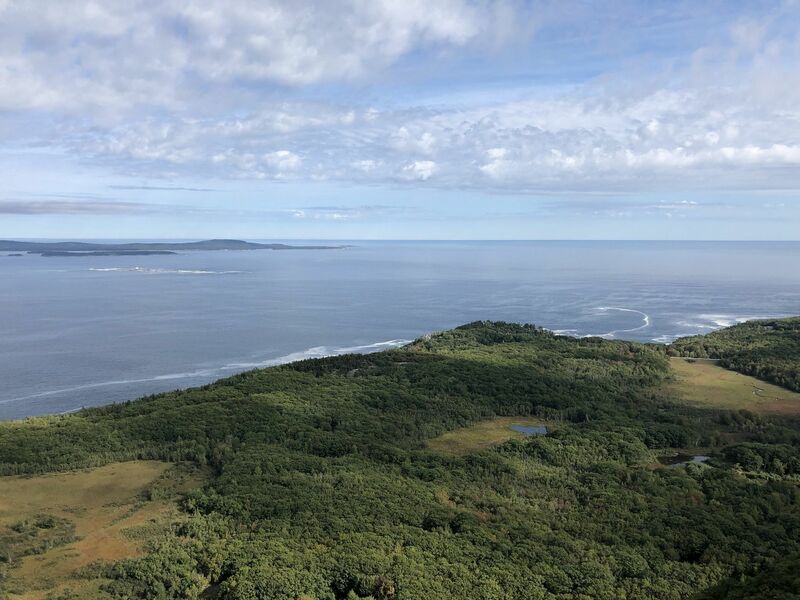 The islands sprinkled in the Bay are the Porcupine Islands. With their domed backs covered with quill-like spruce trees they certainly look like porcupines. 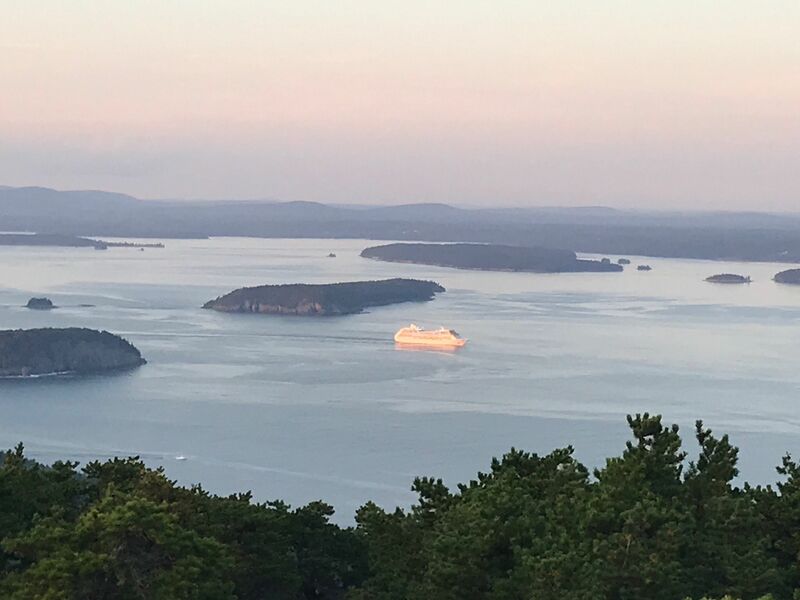 The island closest to the shore, just off the coast of Bar Harbor, is Bar Island from which the town gets its name. 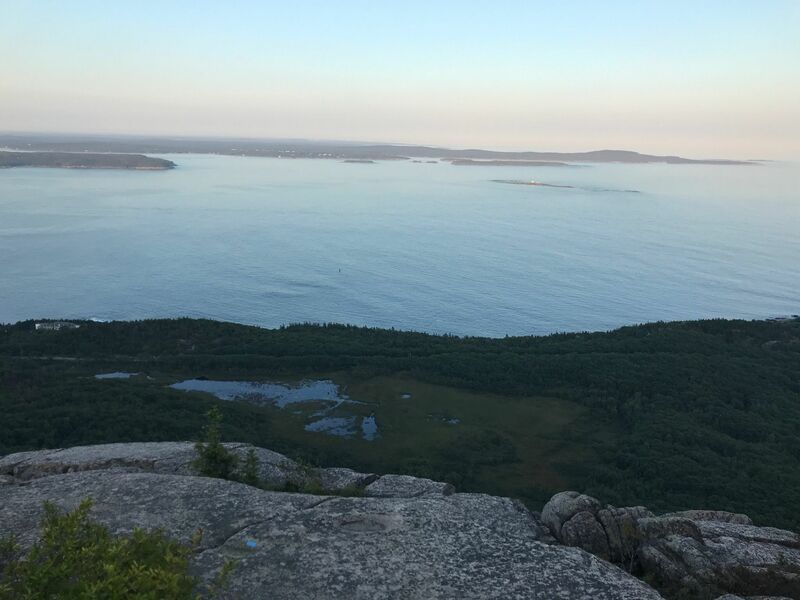 At low tide a sand bar is exposed and you can walk to the island, which is part of Acadia National Park. 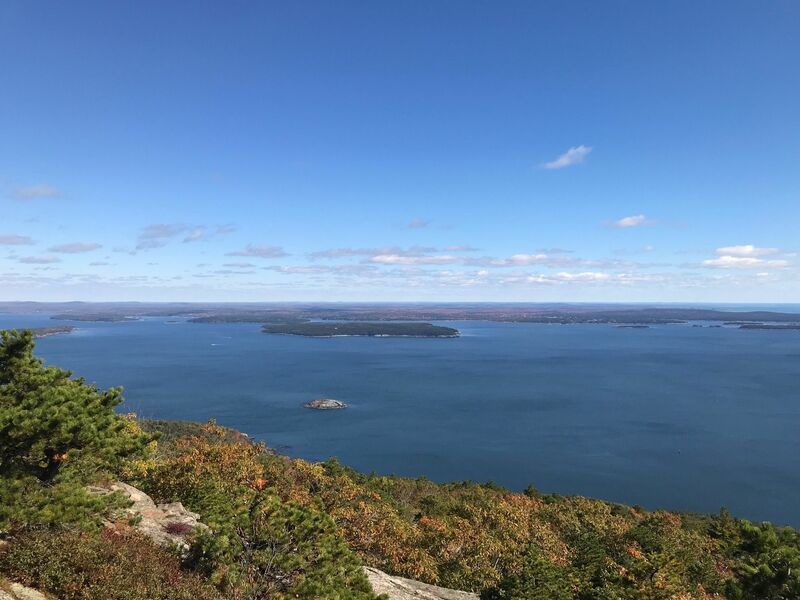 The town of Bar Harbor has a year- round population of about 5000 people but in the summer the population swells as seasonal residents, shop owners and tourists come to appreciate the relaxed atmosphere of this coastal fishing village. 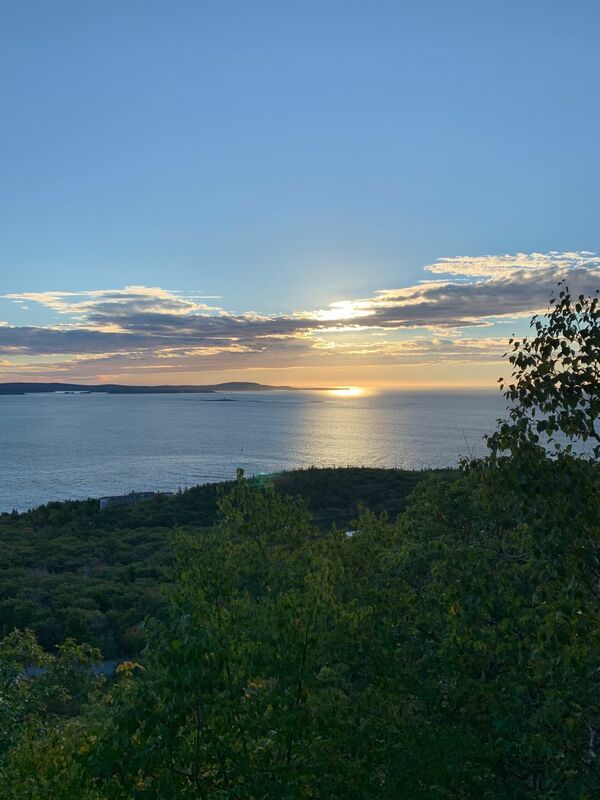 From this point you are looking about five miles across Frenchman's Bay to Schoodic Peninsula. 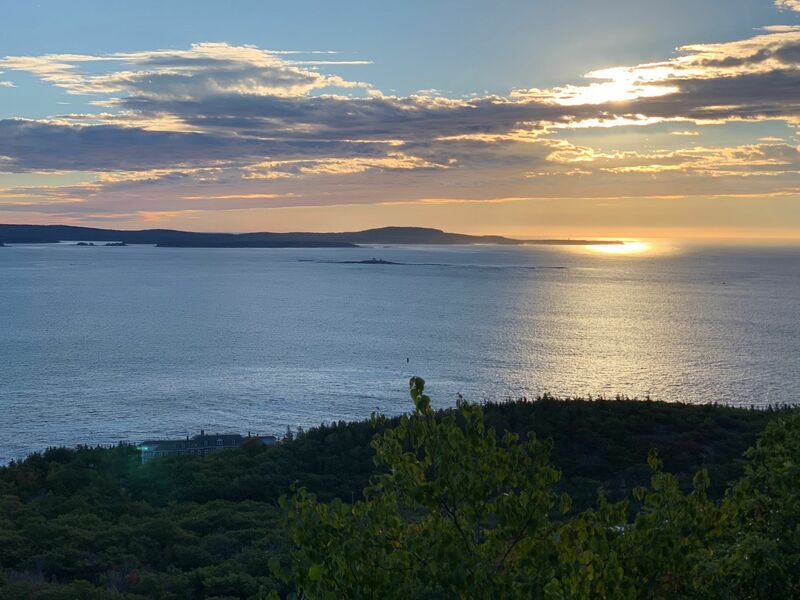 Schoodic is also part of Acadia National Park and is about an hour's ride from Bar Harbor. 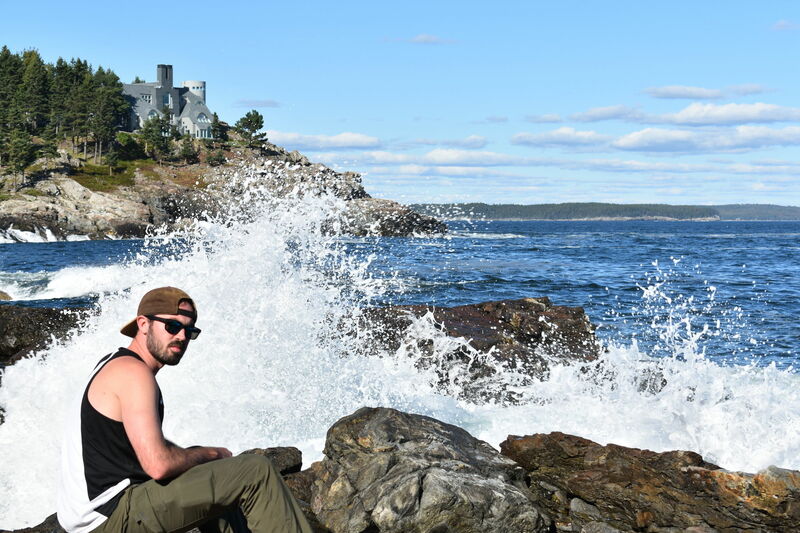 If you have the time its rocky headland and boulder beaches are worth exploring. Between this shore and Schoodic Peninsula is Egg Rock Lighthouse. Built in 1875 the light guides ships into the busy waters of Frenchman's Bay. The light was automated in 1977 and other than the occasional Coast Guard maintenance crew the only residents are the gulls, terns and harbor seals that breed on the island. 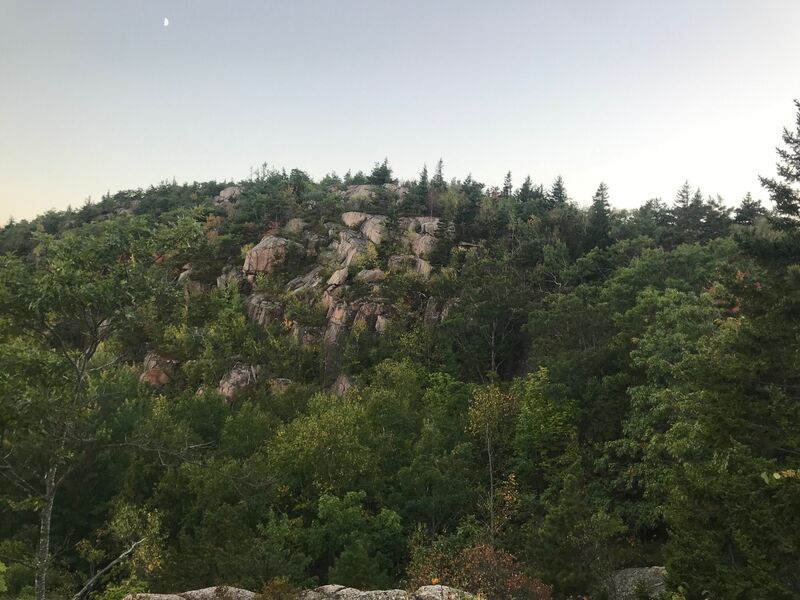 The rocky outcrop to the South, is called Schooner Head. The large building is a private residence. 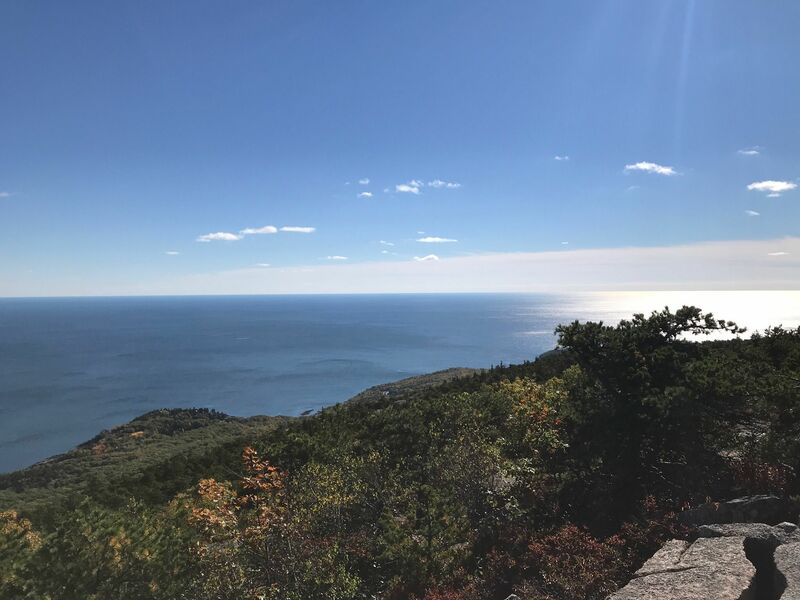 Acadia National Park grew through the donations of generous donors, but there are many areas within the park that are still in private hands. Schooner Head is one of them. Look for other Naturepod tours to aid in your enjoyment of the park. 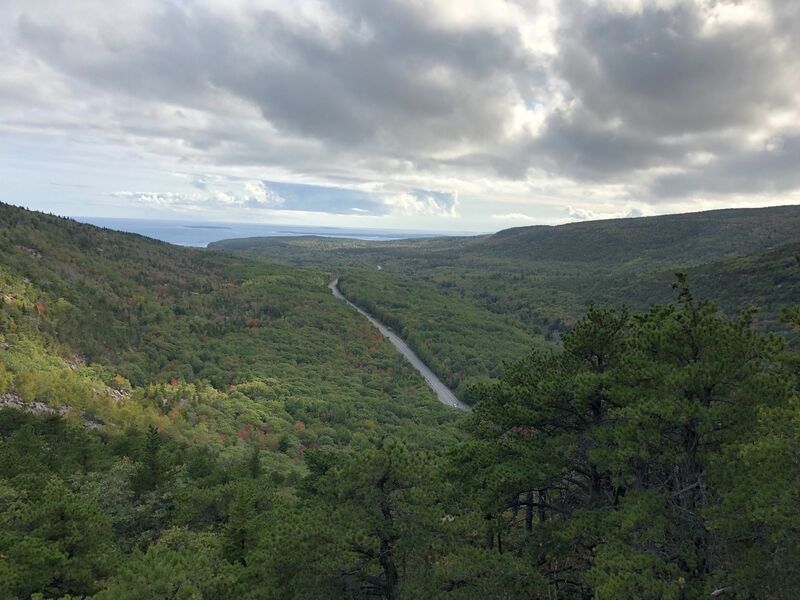 Getting to Acadia: From Boston take I-95 north to Augusta, Maine, then Route 3 east to Ellsworth, and on to Mount Desert Island. For an alternate route, continue on I-95 north to Bangor, Maine, then take Route 1A east to Ellsworth. 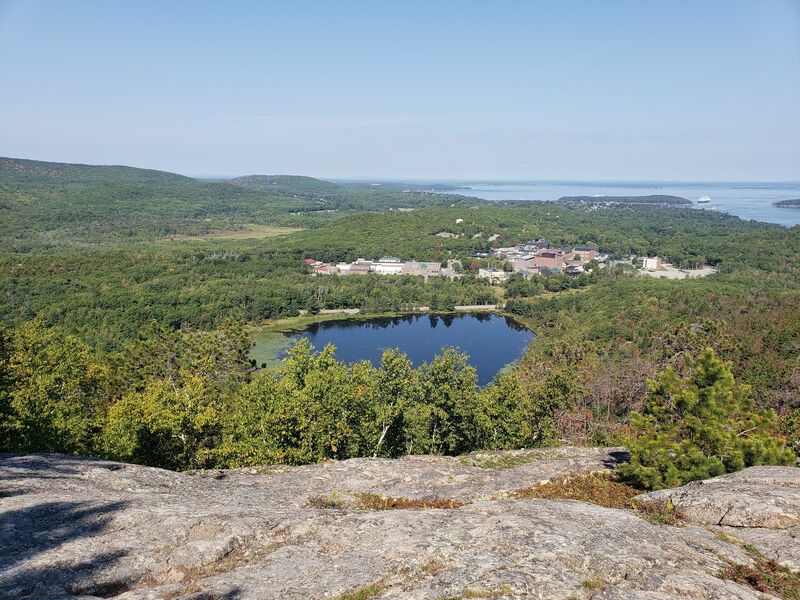 In Ellsworth, take Route 3 to Mount Desert Island. 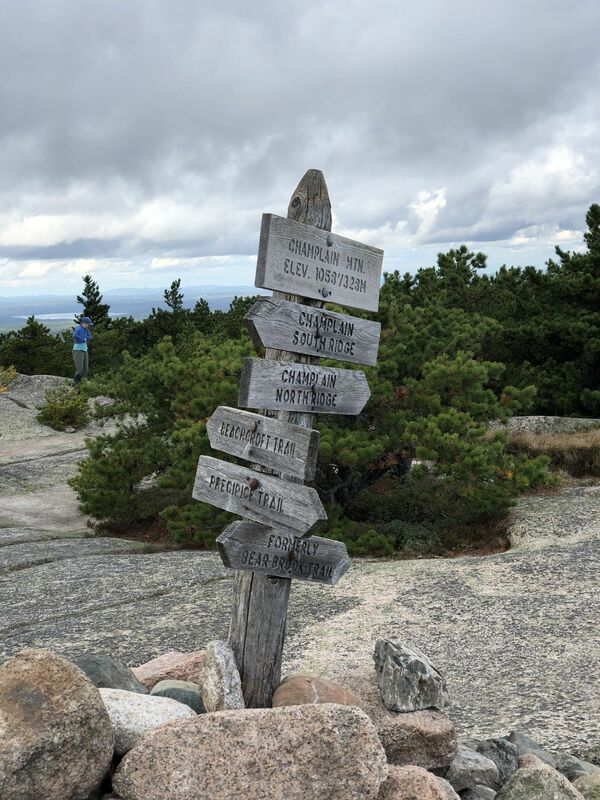 Getting to the trailhead: Trailhead is on the east side of Mt. Desert Island. 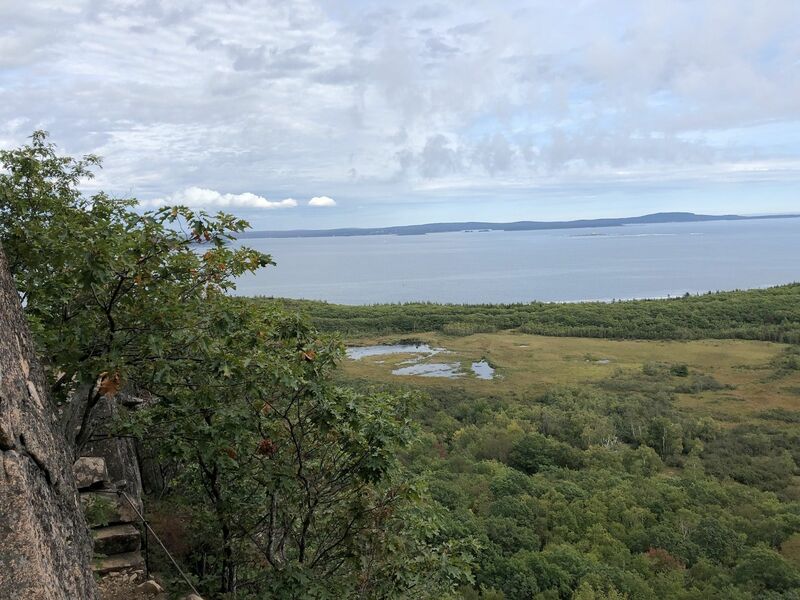 From Hulls Cove Visitor Center take the park road to the one-way loop road (take left just before the road to the top of Cadillac Mountain). Go a few miles and the trailhead will be on your right (well-marked) BEFORE the entrance station. Precipice Parking Area is located on the one-way loop road before the East Entrance Station. Trail may be closed up until mid-August due to nesting Peregrine Falcons... once the chicks are able to leave the nest the trail is opened. Parking may be an issue as even though there are ample spaces, this is a very popular trail in season. 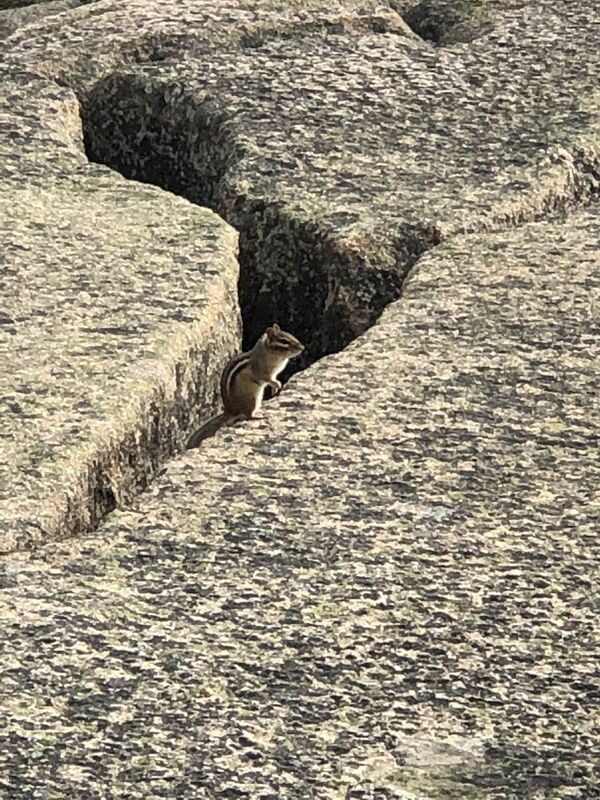 WARNING: This area is part of Acadia National Park proper, and even though it is located before the entrance station, you MUST have a park pass, or there is a good chance you WILL BE TICKETED. No restroom facilities at the trailhead. Loved every part of this trail. 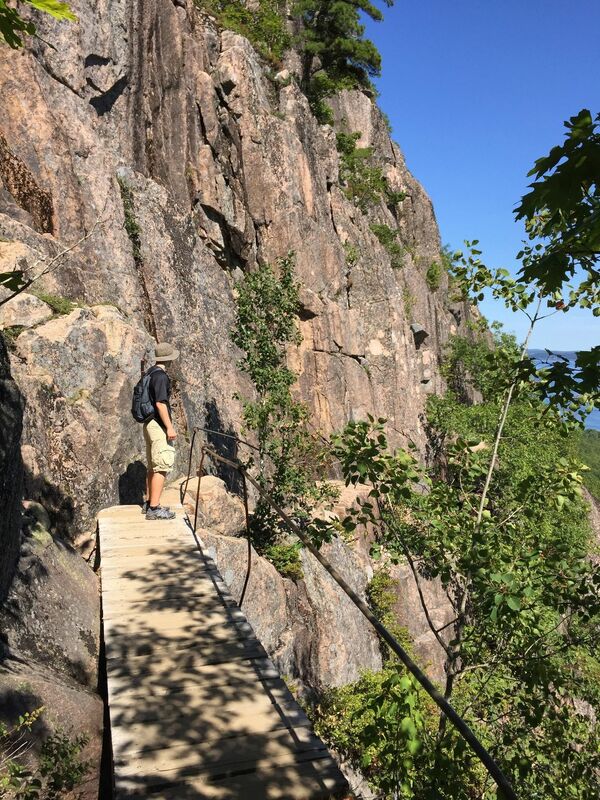 You definitely should not descend from Champlain via this trail. Best and most exciting hike I’ve ever done! 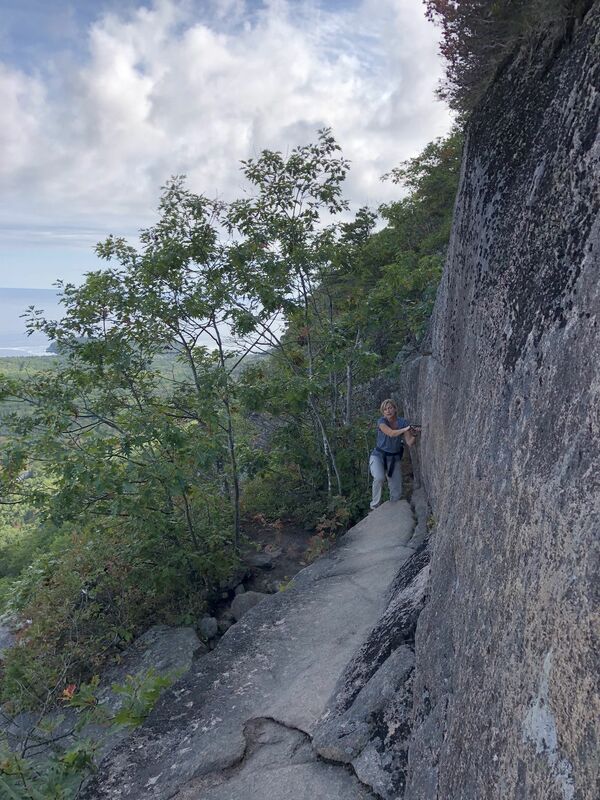 Loved the challenge - we had our baby strapped to us (she loved it) - hiking up the iron rungs was a lot of fun.. if you’re scared of heights I wouldn’t recommend! Awesome and scary hike. 100% worth it but not for the faint at heart. We went at around 2pm and the trail was empty which was nice. 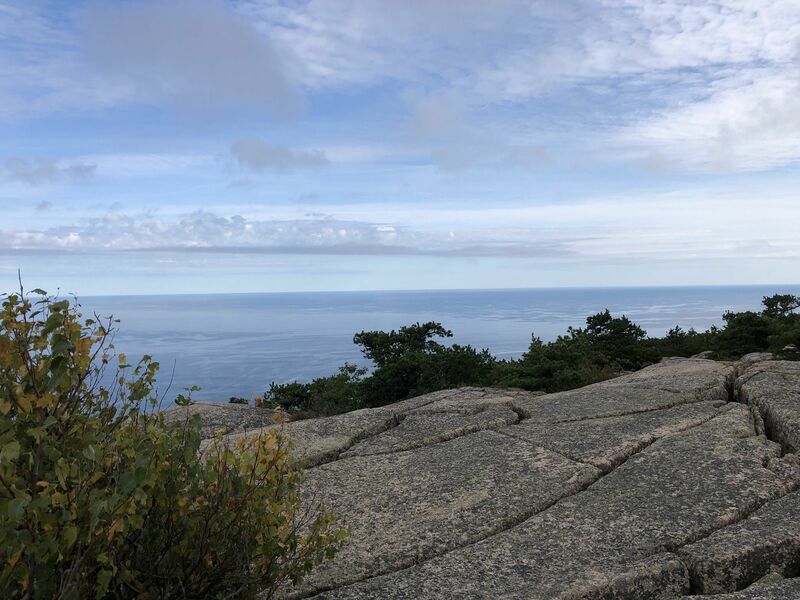 I did the precipice trail in August 2018. It definitely is not an out and back trail, since there are many spots where it is dangerous to pass other people. 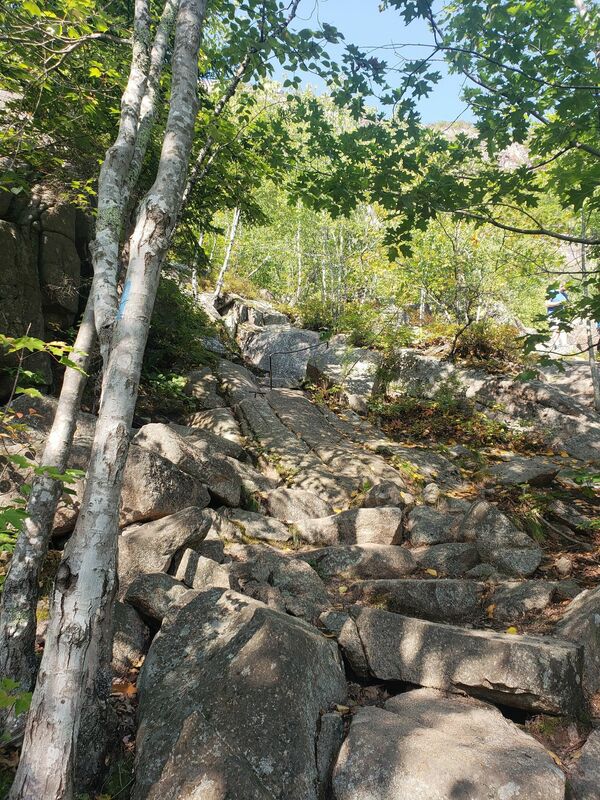 This was the first trail I did in Acadia this time I went. It would be difficult for someone who is afraid of heights and I would not recommend it for that. I honestly thought it would be more challenging than it was. As AllTrails lists this route as an 'out-and-back' and we summited Chaplains, we thought we could be able to descend via Precipice. 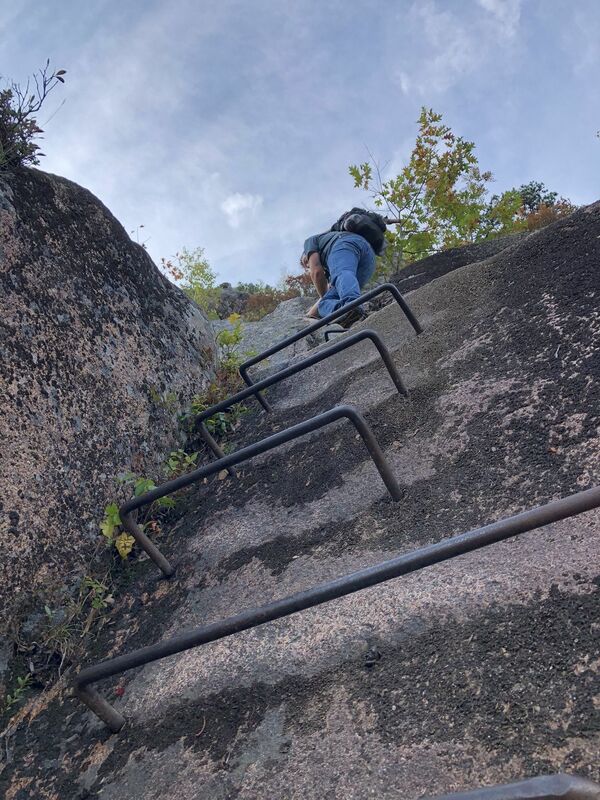 After attempting to descend for about 0.2mi, it seemed unwise to continue because of the grade and ice forming over the steep face...let alone going down the iron rungs. 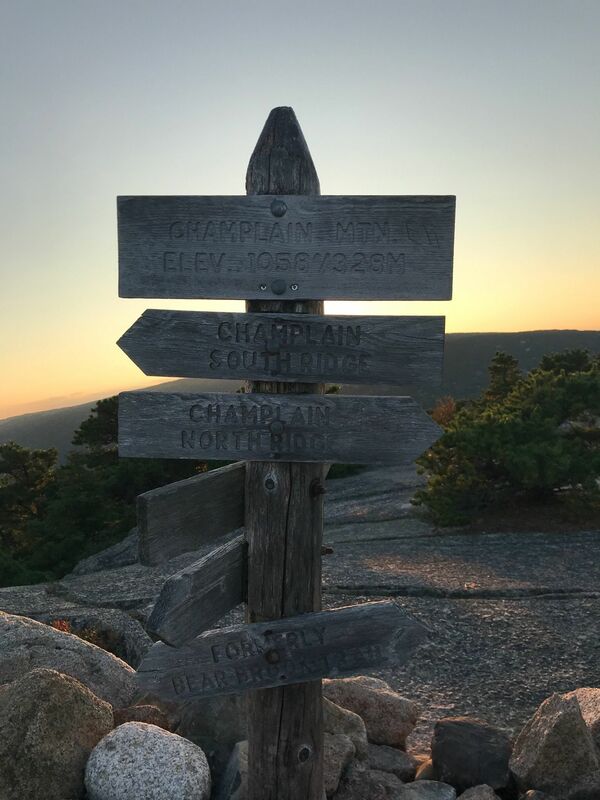 While signs warn that this isn't recommend to descend from Chaplains via Precipice, the app's distinction of an 'out-and-back' gives a contrary and potentially dangerous impression. Exhilarating trail. Tough in some sections but not impossible. First rung&ladder challenge is the toughest... if you can do this one, you can do the rest. In the colder months, leave plenty of time because there’s ice in many areas. 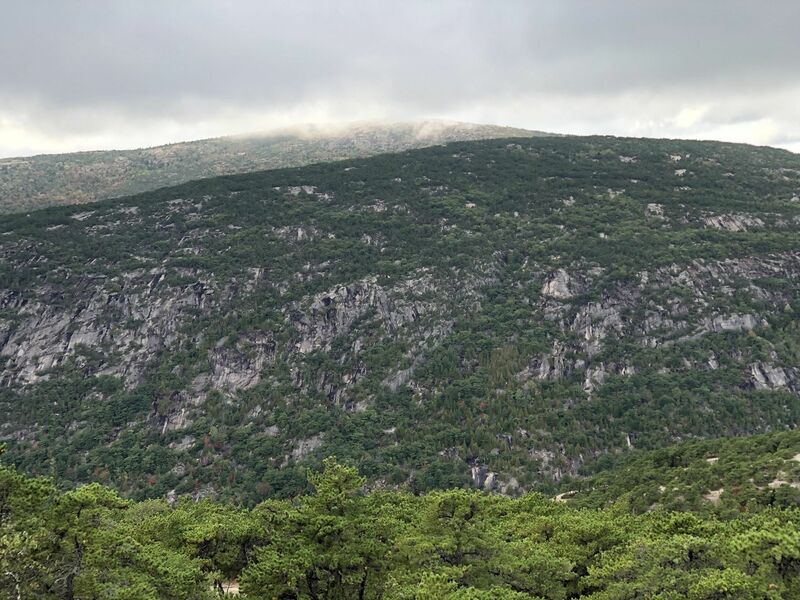 For a short hike with a relatively small increase in elevation, this trail packs a punch. Definitely can’t do this just once! This trail is amazing. Be careful during rain tho. This is the best trail I have ever done! 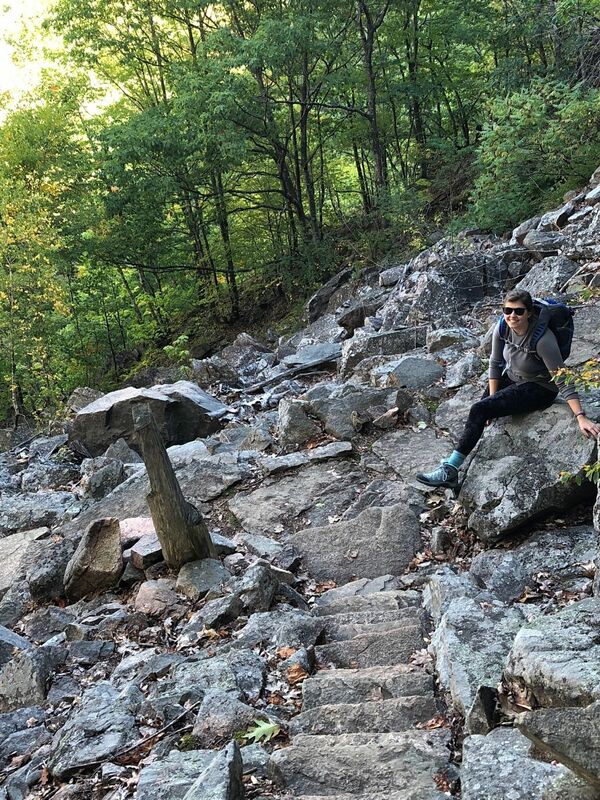 The most beautiful trail for the entire time of the hike and even more gorgeous at the top! I would do this trail again in a heartbeat! Precipice made Beehive seem like child's play. 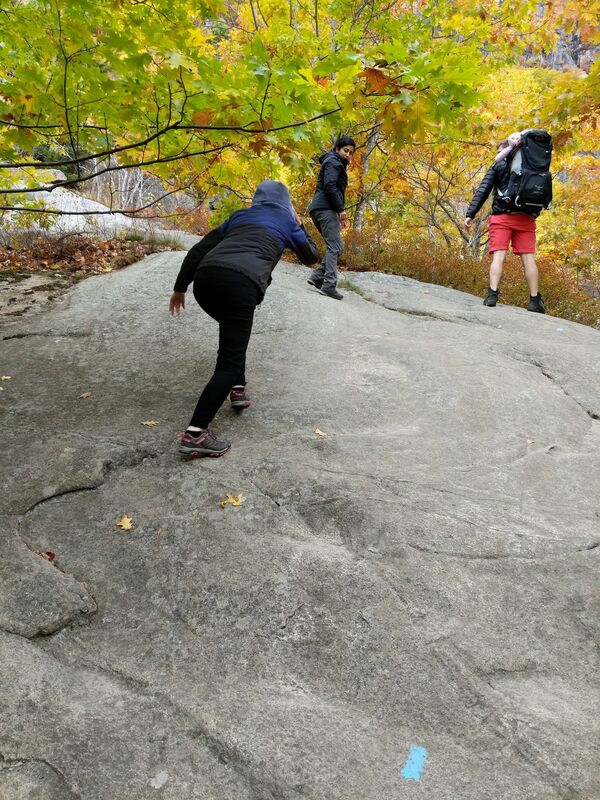 The beginning of the trail starts off with some pretty cool boulder hopping. You have nice views within 10 minutes. 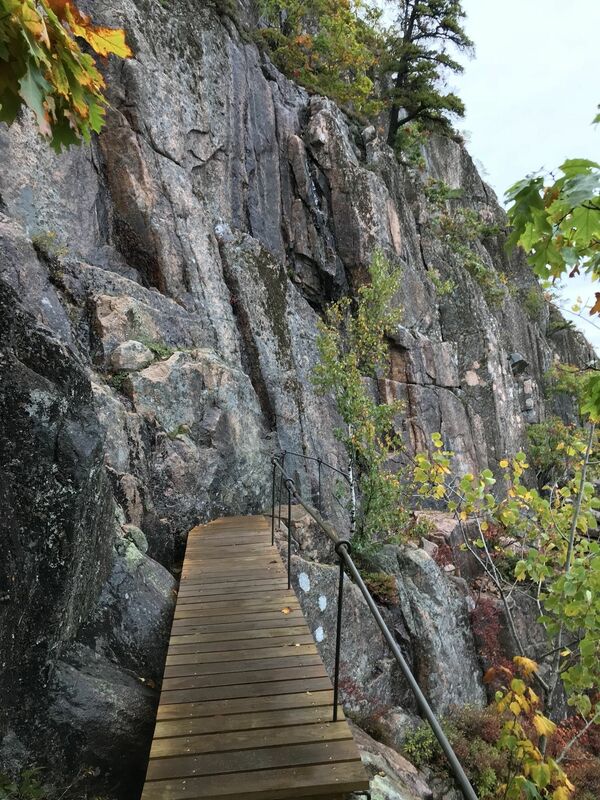 The rest of the trail is a series of switchbacks, ladders, steps, and bridges. You're on cliff faces the majority of the way up. I felt safe, but wet rocks/rain could make for a pretty dangerous ascent. We hiked up and over, down the Orange/Black trail to the road, and followed the road back to the Precipice lot. We did this after sunrise on Cadillac and saw only 2 couples. 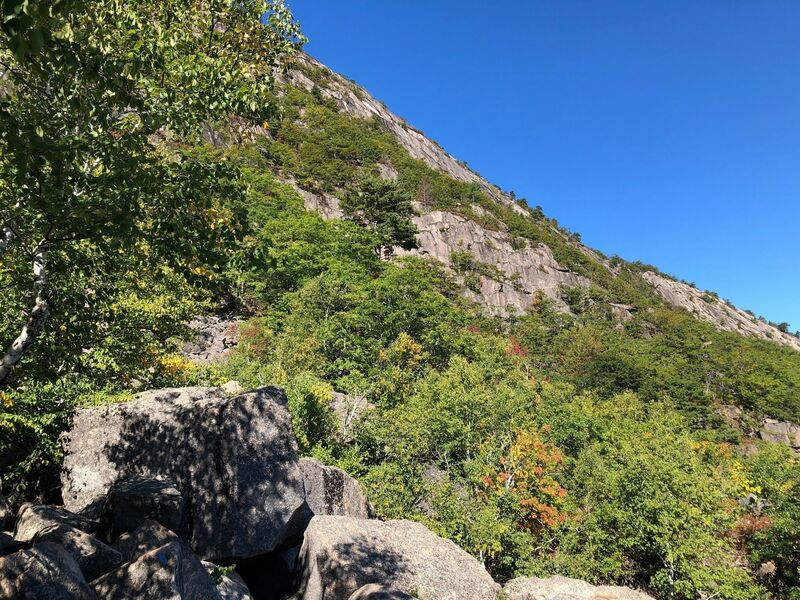 Awesome hike during peak foliage! S’ok. Fairly easy all the way up if you have any climbing background. Just a simple scramble at best. The whole hike is one amazing view, just at different altitudes! So much fun. Excellent trail! 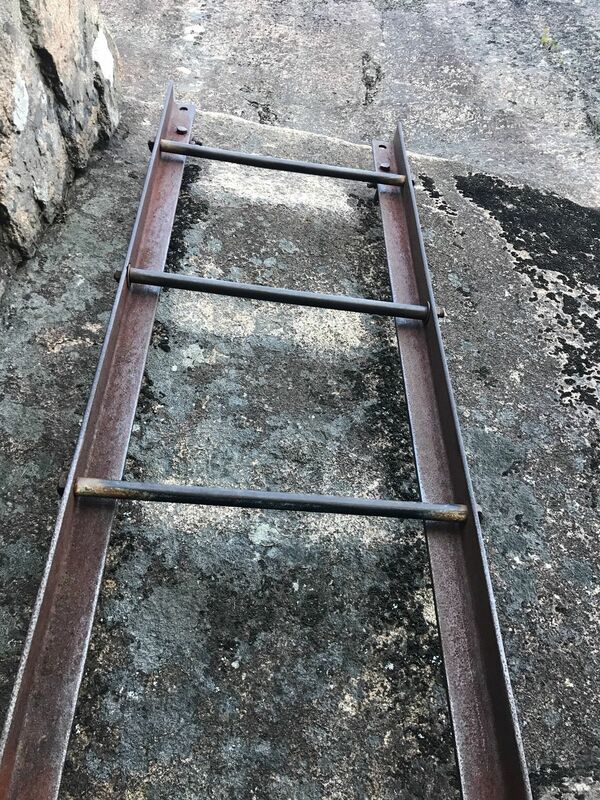 Lots of fun with many rails to help you along and keep you from falling or slipping. I would suggest only climbing this one in good weather/visibility and only if you are physically capable of it. There isn’t any good way to back track during the tricky turns and ledges. 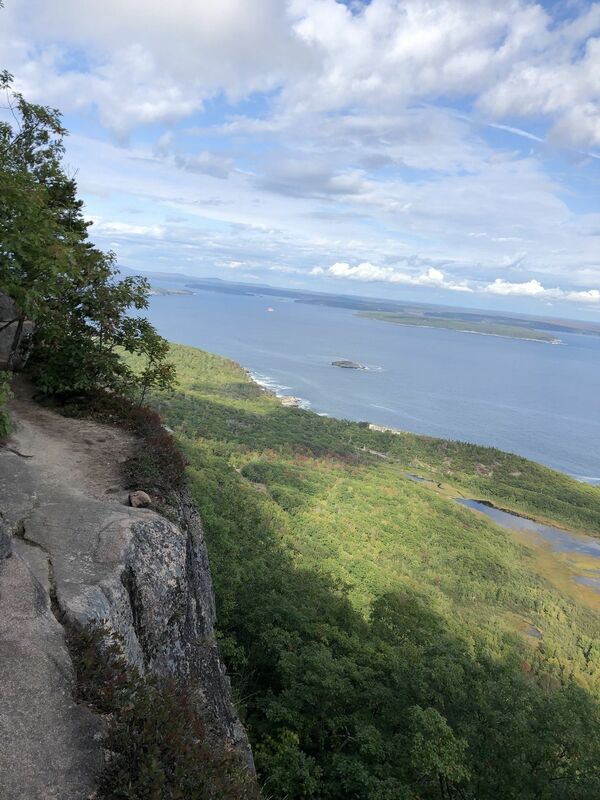 I am so glad I made it onto this trail while in Acadia. It’s one of the coolest experiences I’ve had hiking! Favourite trail of all time! I was a little worried at first given all the warnings about the steep drops. We ended up doing the hike while it was drizzling so definitely added to the adventure. Overall it’s a solid challenging hike but if you focus and are careful there’s no reason why you can’t finish. 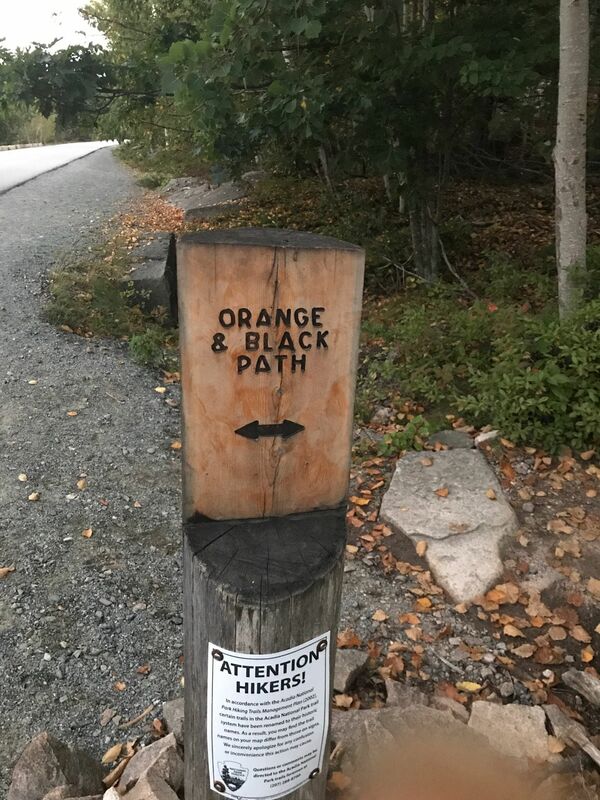 Takes about 2 hours round trip (going down the Orange/Black trail). 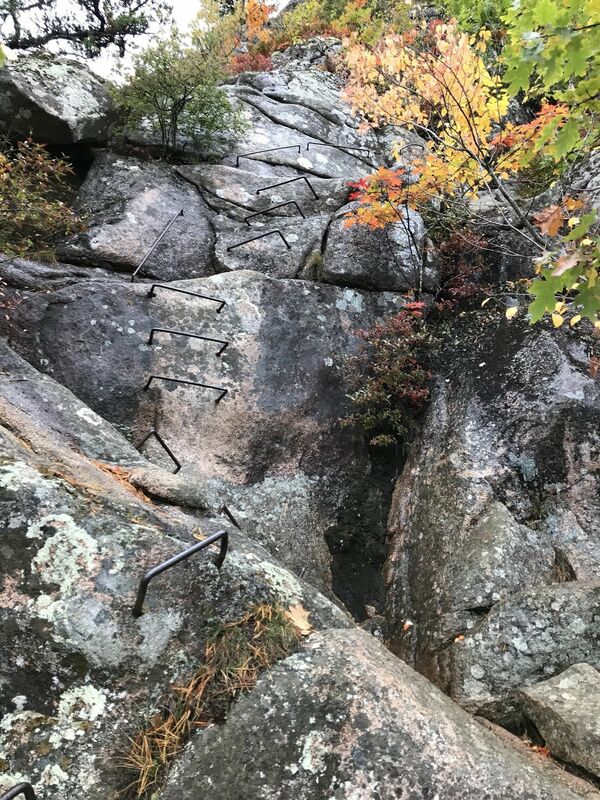 The first 20 minutes are a rock scramble with some introduction to the iron rungs, the next 30 minutes you’ll be moving vertically and laterally holding onto iron rungs, the last 10 minutes to the top are a mix of rock scramble and rungs. Took us about an hour to get down since it was wet and we were being careful. 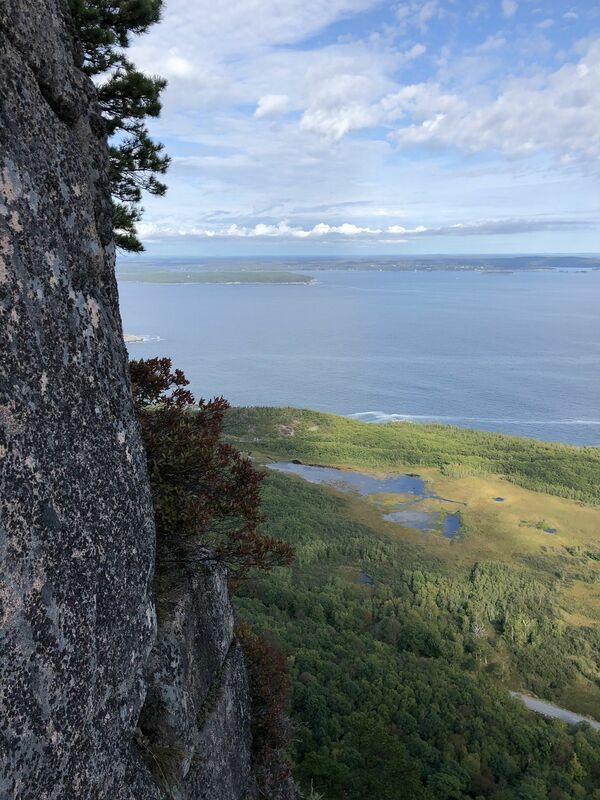 If you have a phobia of heights, this hike is not for you. But if you’re just uncomfortable like I am then this is a great way to get comfortable and feel accomplished. The views are unbelievable. 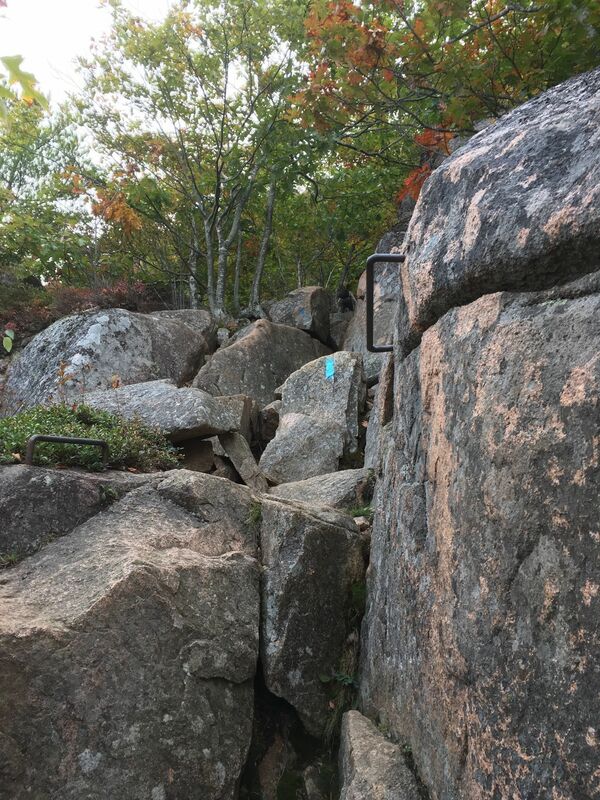 The most challenging and rewarding scrambling trail I’ve done. It pushes you to your limit in the best way with fantastic views the whole way. Do it! Best hike in the park. Best views. Wow what a great experience. Not for kids or dogs. Lots of steep climbing. Be careful. I was nervous about doing this trail but ended up loving it and having a great time. The views are amazing and you really get a sense of accomplishment when you get to the top. My husband and I started around 730 to avoid crowds and only saw a couple other people on the trail. Unbelievable views at every turn!! 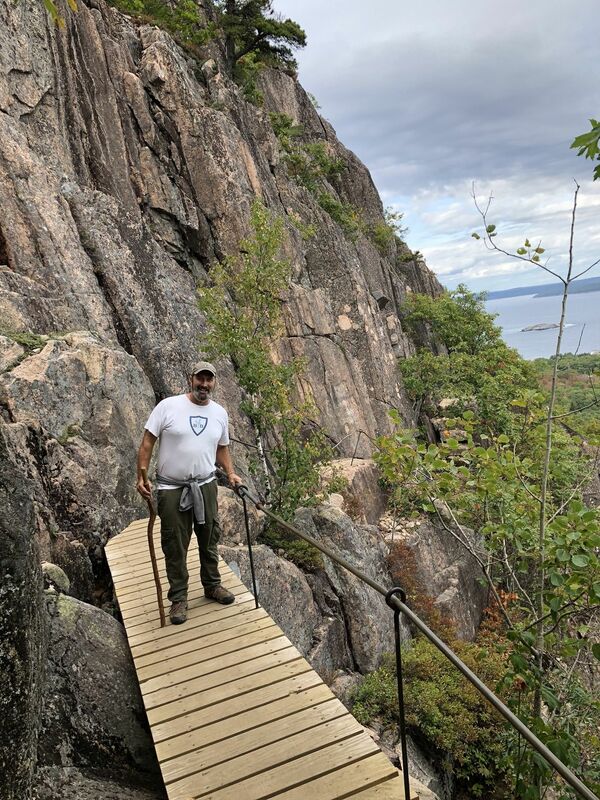 First time hiking a trail like this, exhilarating and a great feeling of accomplishment when completed. Fantastic via ferrata route. Not for the faint of heart or little ones. Expect traffic jams during high season. Otherwise totally worth it. 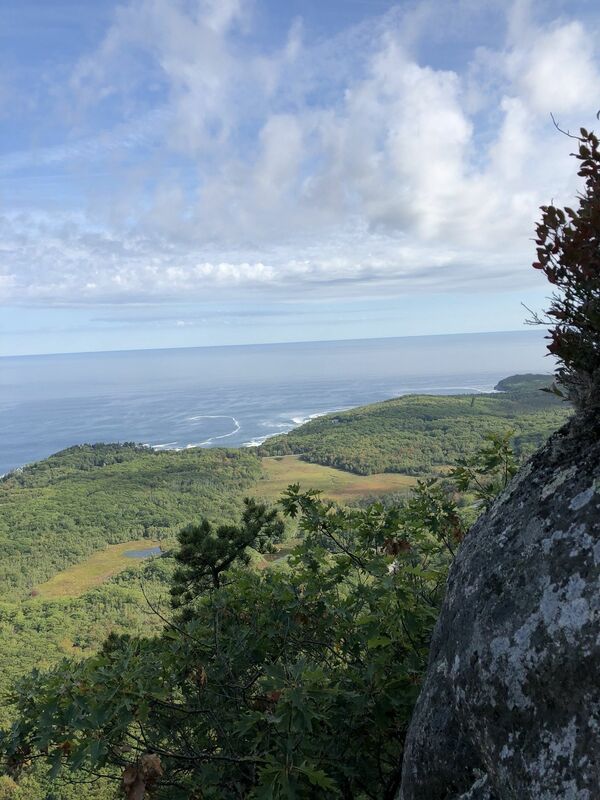 The views are great and the adventure will get your heart pumping. This was a good way down after doing the Precipice trail. 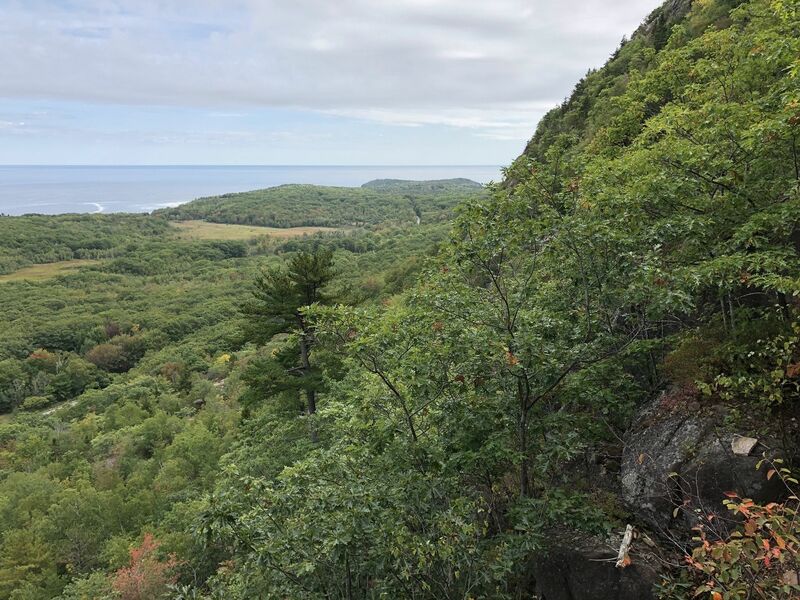 Another option descending after the Precipice and Champlain Ridge trail sections is to take the Orange and Black path down to Ocean Drive, and then back to the Precipice trailhead parking lot. It makes for a more relaxed end after bouldering and climbing up ladders. Worth the effort. 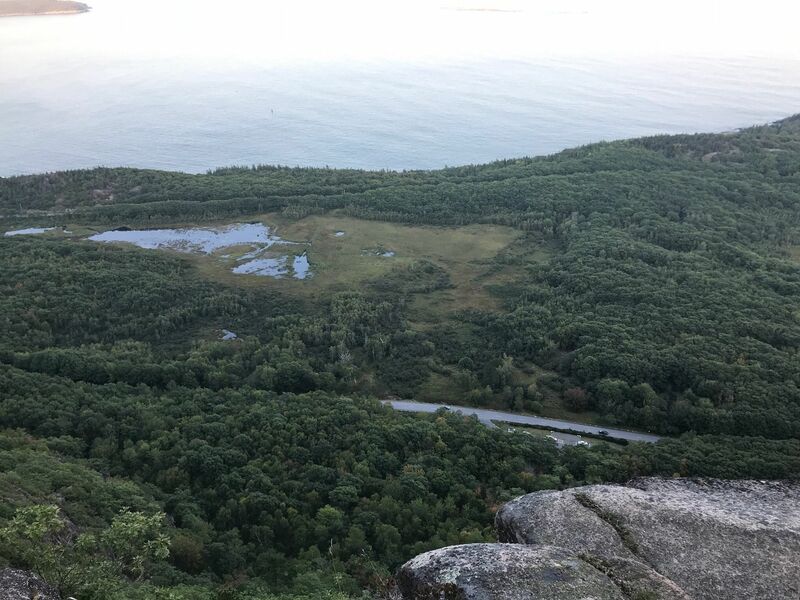 Super unique and fun hike! I would not plan this as an "out and back" route though. A lot of the sections are narrow and steep. Coming down while others are coming up would not work in a lot of areas. 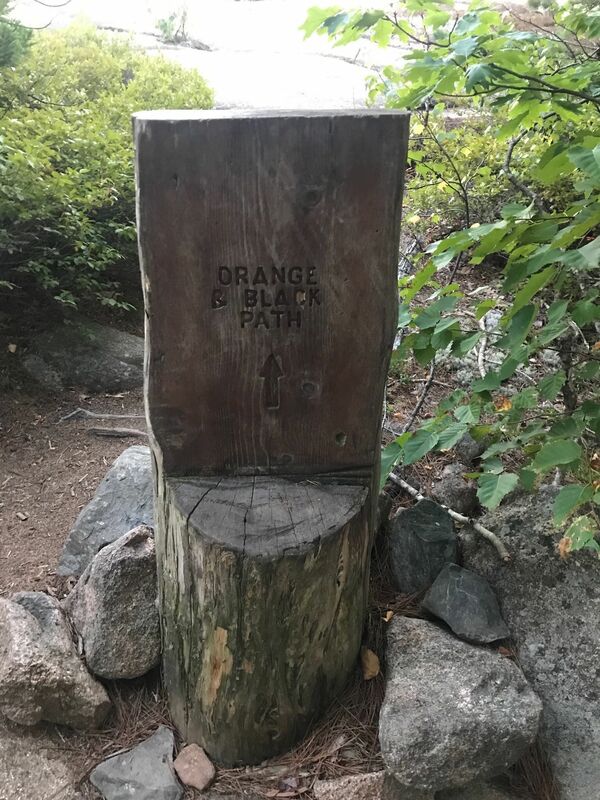 Plan for a loop following the Champlain North Ridge Trail and Orange and Black Path (there's a separate hike listing that follows this route). We took the Orange and Black down to Ocean Drive and walked along the road. Going down that route is way easier. 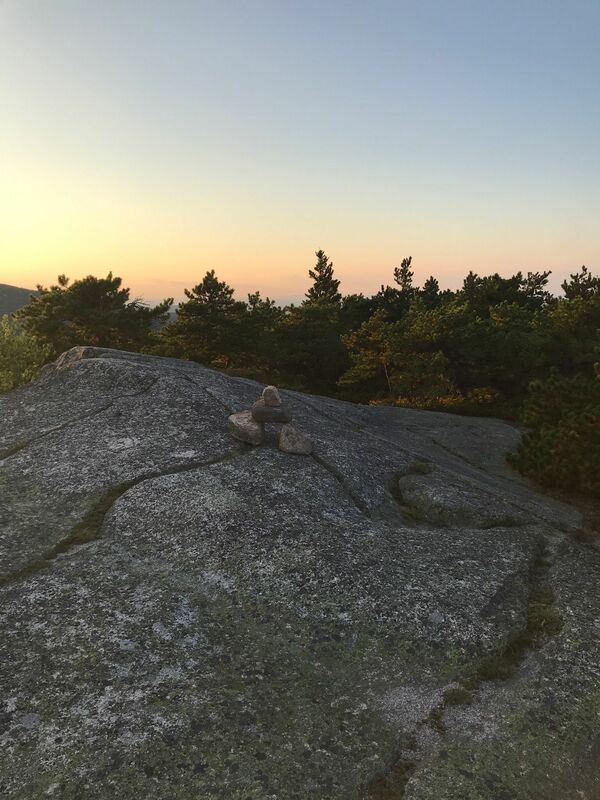 Also, we started the hike later in the afternoon to make sunset at the summit. 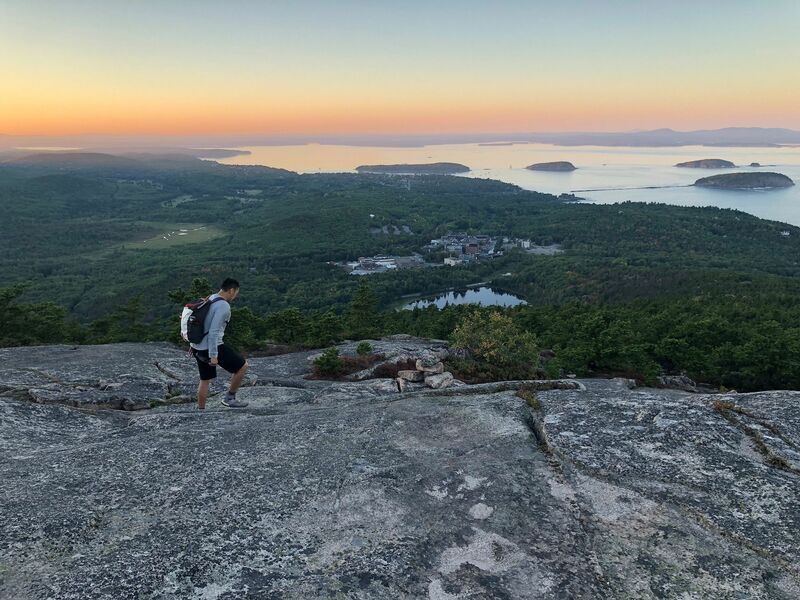 The views of the bay and sunset were awesome from the top. The path was not crowded at this time, but it was nearly dark by the time we got back to the Precipice trailhead parking lot. Bring flashlights if you're getting a late start. Well the app deleted my path but just to let you all know. This is a nontechnical climbing trail not hiking so for your safety please be prepared. I loved it. I took the path that made up 4.2 miles instead of just the basic trail. 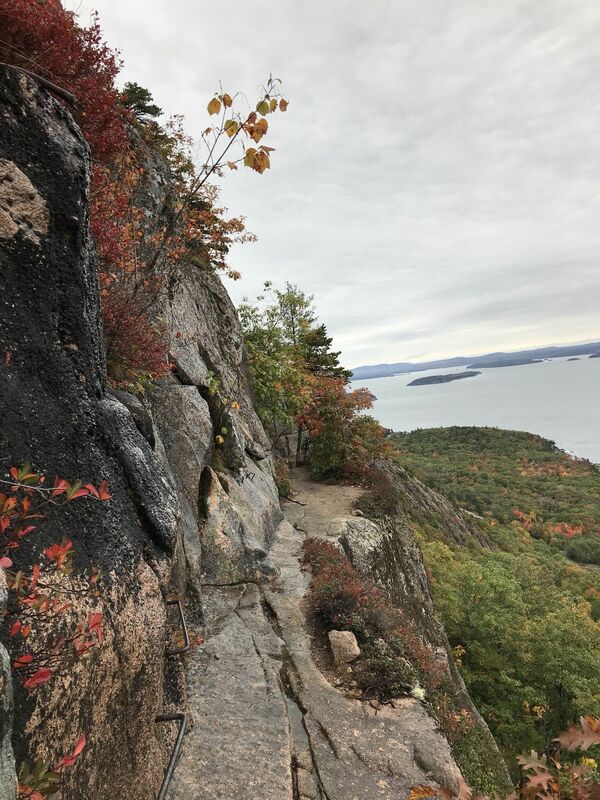 Precipice-lake Champlain- orange and black trail. It was amazing.